Talk about a one heck of a sugar rush, the Sugar Pop fun slot game is an exciting new variation of its own- right at the moment. All it takes for you to be a part of this fun game is to simply start free game play with absolutely no registration or sign-up needed. So for those that think that free sugar can be bad for you- check out these tasty candy treats that make the game even more unique to itself. The game is really simple however it does look more complicated on the surface. The imposing 5x5 grid looks more difficult to secure wins, however all that is needed is to arrange any three similar colored candy in either a vertical way or horizontal position that is connected. Essentially a string of matching symbols (much like those bubble games you see on Facebook), which award prizes and plenty of surprises along your journey upward though 20 or more cool levels.Each and every candy has a distinct feature that can be put to use by arranging the candy in a certain order, or causes an added winning effect or feature into motion. These special features found in Sugar Pop slot aren’t exclusively just for fun play only, you can actually play with real money- if you so wish! With such an exciting and unique feature that attracts you to this game, the potentials to actually win real money unlike those cheating Bubble Saga games where they always bug you to buy virtual coins with no chance to win anything real!!! In addition to this, the multiple levels only serve to raise the return winnings you can achieve, so it only makes sense that you might consider real wagered bets from Sugar Pop. When you’re ready you can easily follow the link to any of the responsible online casino portals. What makes online slot fun really pop? One more exciting thing about the Sugar Pop fun slot is that it’s also available to play as a mobile slot machine too! This touchscreen version is just as easy to play, and it can be played anywhere you like. It’s because of that convenience, it may just help you to relax your mind, after a stressful day or even when you want to pass the time. It is compatible with the Windows phone, Android, iPhone, Linux and Mac categories of mobile smartphones and tablets. Ok, we won’t leave out the owners of laptops either since you can connect to the internet just as easy. No download needed, or is there?.. 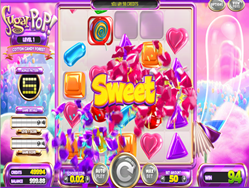 As most online slot games often allow, there are apps and download versions of their games available, however in the case of the Sugar Pop slot, you might need one additional download that is simply silly sounding. Most modern gadgets and pc’s don’t need to download flash to run most of the online game we see so often. Understandably there may be the need to download the Adobe Flash Player, which is about as ancient a technology as the dinosaurs. However older mobile models and pc’s do require this software to run games from Betsoft. If you do encounter this problem, simply download the ‘Flash’ player program to run this slot game without any problems whatsoever.